Peanut Butter (Peanuts, Hydrogenated Cottonseed And Canola Oil, Salt, TBHQ, Citric Acid), Graham Cracker (Wheat Flour, Sugar, High Fructose Corn Syrup, Partially Hydrogenated Soy Bean Oil, Graham Flour, Corn Starch, Vanilla, Bicarbonate Of Soda, Soy Lecithin, Salt, Molasses), Coating (Sugar, Partially Hydrogenated Palm Kernel Oil, Cocoa, Skim Milk, Soy Lecithin, Sorbitan Monostearate, Polysorbate 60), Whey Protein Isolate, Salt. 100% Real Peanut Butter, 100% Real Graham Cracker layers and 100% Real Taste Satisfaction! All this and 15 g of Protein in every bar. A truly delicious and convenient protein snack packed with energy to get you through the day. 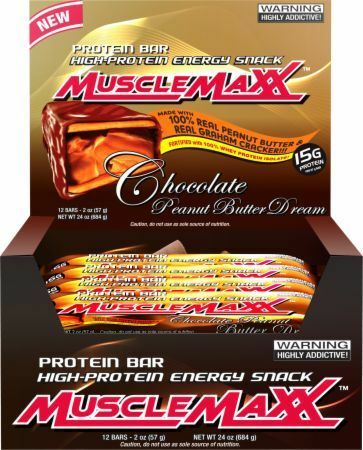 When you need a snack, reach for MuscleMaxx High-Energy Protein Bars! When you are looking for a truly delicious protein snack that gives you the kind of satisfaction of a delicious chocolate bar, look no further. 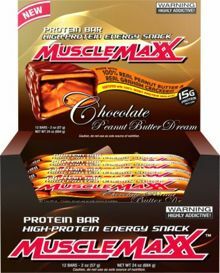 MuscleMaxx bars deliver on taste, texture and protein. Unlike other protein bars out there, MuscleMaxx is made with REAL ingredients; a difference you can taste. REAL Peanut Butter and REAL Graham Cracker crunch together to create a satisfying taste experience that will keep you coming back for more. Fortified with Whey Protein Isolate and 15 g protein in a smaller 57 g bar, MuscleMaxx is the tempting treat you can love to eat.